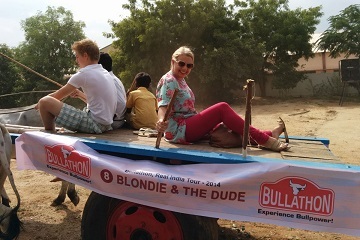 Bullathon, a real adventure in India! 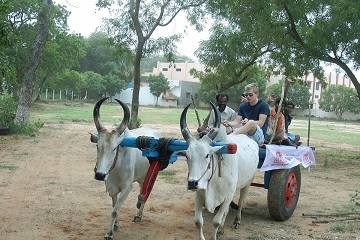 Training in how to master the art of Bullock Cart control is given at the phenomenal Kadambavanam resort in the midst of an ancient forest, or vanam, just 25km away from the hustle and bustle of the city streets, this is a trip to India like no other. 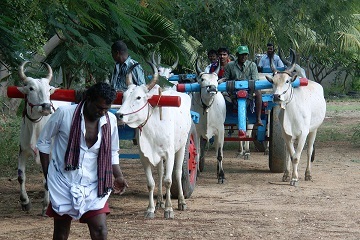 The Kadambam hardwood is central to the local tradition, Tamil culture and history. Kadambavanam is the world’s first Cultural Centre & Ethnic Resort, simultaneously offering a luxurious stay and capturing the essence of the living traditions of Madurai. 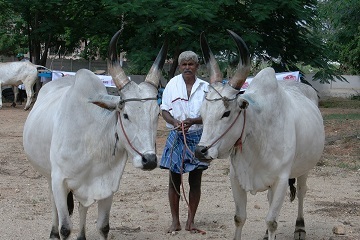 Using a pioneering ‘social entrepreneurship’ model involving local villagers and craftsmen Kadambavanam promotes, and preserves, precious Tamil art forms as well as providing employment and support for local artists. 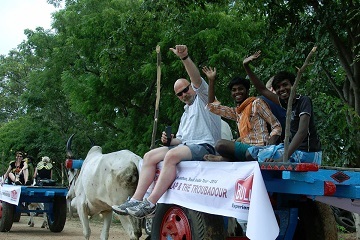 Guests of the Bullathon will experience local arts and crafts, the local cuisine, spiritual traditions, games and sports, as well as language and literature programs to ensure that this is a unrivaled authentic experience that will make this journey through Southern India something you will remember forever. 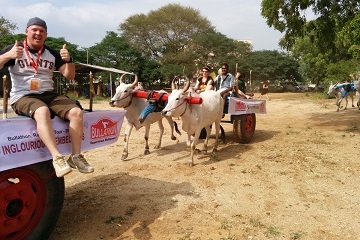 Whether it’s the bragging rights of winning the grand prize for the most Bullpoints or the experience of having been at the helm of your own Bullock Cart, the Bullathon is a highlight of India in itself and you’ll never forget the experience of this experience that allows you to explore the real India in the most unique adventure of them all. 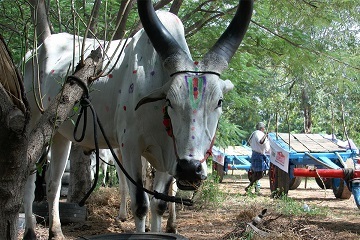 With all the local festivals at that time of year the itinerary of the Bullathon is subject to variation so that we at The Travel Scientists can take you to where you’ll have the best experience possible of the amazing country, the Tamil culture, its people and traditions. Slow down and see all the details which usually slip your attention. 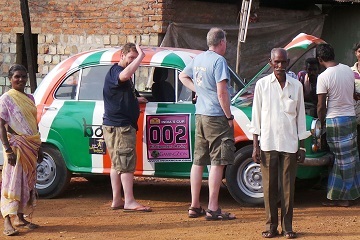 Interact with the locals as closely as it can get. 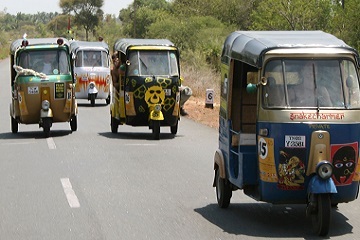 Get a feel for the real India on the country’s rural backstreets. Pass small villages hardly any foreigners have seen before. Relax on the beach as reward for a long ride. 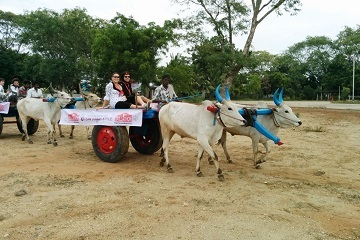 Orientation Day – Bullock Cart control lessons to get you ready for the open road in the superb surroundings of Kadambavanam. 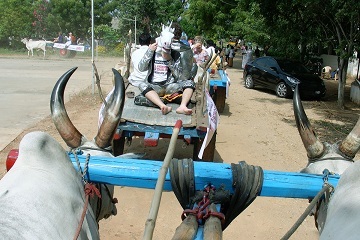 Travel to Narikkudi. Sounds easy but every day there will be challenges, cultural treasure hunts, photo safaris, and historical waypoint goals to participate in, and the winners get Bullpoints. Ride the rural roads, catch as many Bullpoints as you can along the way, and experience the India that you miss if it is only a blur outside the window. Arrive triumphant at the shoreside for our traditional closing ceremonies, the award of prizes to the Bullpoint winners and one of our world famous after event drinks parties. 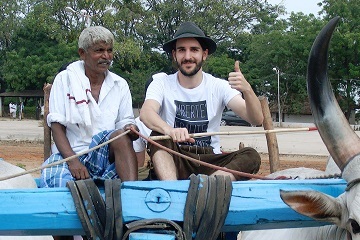 Deposit: You’ll need to put down a deposit of €1000 for the Bullock Cart. Might not be cheap, but we find from experience that it’s enough to stop people crashing their cart for the hell of it. This also acts as an expense account for any repairs that are needed,if your package doesn’t cover it. You can find the costs of spare cart parts in the road book once you sign up.